What’s wrong with this picture? Shouldn't leaders delegate to their team? As always this is not as straightforward as it seems. On one hand leaders should delegate tasks and assignments to team members. It’s a great opportunity to develop team members and build their skills. Leaders can start with simpler tasks and assignments and as the capability of the team and individuals goes up, leaders can delegate more complex and challenging assignments. Doing so gives leaders a wonderful opportunity to coach and mentor team members. Often this is tied in with developing problem solving skills and A3 Thinking. When leaders delegate tasks they are still responsible for the outcome. Leaders can’t delegate the responsibility along with the task. 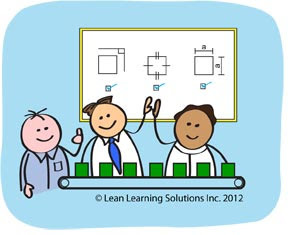 Leaders who do so are not exhibiting Lean behaviors; rather they are using Lean as an abdication of their responsibilities. Leaders who delegate tasks but retain responsibility for the results must coach & mentor the team member(s) and thus build the capability of their team ensuring both short and long term business results. Leaders who delegate both the task and the responsibility for the results while not providing any coaching for the team are failing in their role as a leader of the organization.